JAN WOOLF IS A WRITER AND REVIEWER WHO LIVES IN LONDON. Her first book Fugues on a Funny Bone, a collection of short stories, was published by Muswell Press in 2010. She’s currently putting the finishing touches to a novel based on the memoirs of a Polish painter. The story ‘Ten a Day’ revisits the concept of French Revolutionary Time. Writing took over from visual art in my 40s. I have to thank a Mr David Barnes – my secondary modern art teacher – for giving me the self-belief I could make any art at all. In London: everything is here. It’s a rough diamond and I love it: both for its stimulating subject matter and access to other writers. Most of our free public spaces have little clumps of writers in them, you see a group of people, heads down, talking earnestly, but they’re helping each other with their books. Depends on what else is going on and the time of year, and also what kind of writing (I also edit and publish). At the moment I write in bed on my laptop till 9am, then go to the allotment (I’m lucky to have one) with a notebook. I do ‘work’ type writing in the sitting room in view of the kettle, and sometimes take off to the FreeWord centre or the London Library. If I’m stuck over something or need an idea – I find a moving train helps. I aways have a notebook for thoughts or observations – which means I’m never ‘off’ it. A bit tyrannical really. 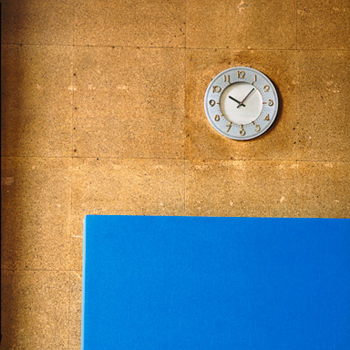 I am drawn to clock faces, and there are fewer of their lovely faces around because of digital technology. I also liked the composition – like a moon over that slab of blue. Yellow and blue are lovely too. What is the thinking behind ‘Ten A Day’? The story leaked out of my psyche (if that isn’t too pretentious). Having chosen that image I was thinking about how we deal with time, and recalled a walk I was on with my walking group CLOG. We explored the Folkestone Trienalle last summer and I was struck by Ruth Ewan’s installation, where she changed 5 of the towns public clock faces to the old French republican 10 hour clock. My story – ‘Ten a Day’ – tells the rest. Do you work with visuals? All the time. I went to art school and constantly key into the visual. One of my art heroes is Kurt Switters whose rips, tears, assemblages made such wonderful visual poetry. Its own language. You’ve published a volume of linked short stories, Fugues on a Funny Bone. Is short fiction your preferred format? I write short stories, as I thought I couldn’t handle the long haul of a novel. I prefer the instant ‘Gestalt’ psychology of visuals, haikus and the short form. Actually, its not like that at all, short stories take ages and you spend as much time reducing language as you take building it in a novel. But now, I’m writing a novel. Every idea finds its right form though. Yes, I do. I have done lots of collaborations: exhibitions against wars, collaborations in campaigns like the Free Museums Campaign, art auctions, benefits. This kind of work has a political edge and purpose and the camaradie is lovely, with egos tamed by the cause. Writing stories and novels is solitary though, until I take knotty bits to one of my writers’ groups. Being in the Writers Guild is also important – as it makes me feel part of something much wider. A novel based on the memoirs of a Polish painter. It’s taking so long, that new short pieces of work are forming in its slipstream. I nearly have a new collection ready. 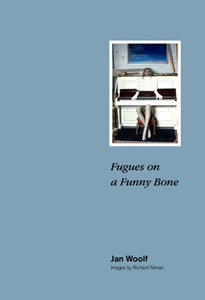 The first Fugues on a Funny Bone was published by Muswell Press in 2010.